﻿﻿﻿﻿﻿﻿﻿ Journalist Ed Bradley once wrote " And I realized that there was no sports reporter, so I started covering sporting events"
This brings me to my blog. Last year the Dawgs made All Star history by sweeping the first seven spots. This years team will feature six runners who didn't run the All star meet. So what can we expect this year? Most likely some very fast times if the weather cooperates. This current crop of distance stars are having an amazing year- they are currently ranked 6th in NJ & number one in SJ. There is only one current Dawg on this years team that is listed on the top 30 all time. That would be Greg Halla who owns the 18th fastest time in 16:04, which he ran in last year all star meet. In order to crack the top 30, & make this esteemed list you need to run sub 16:29. 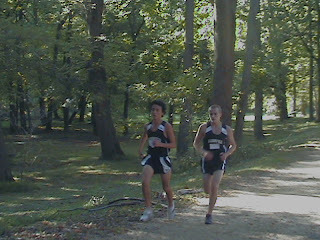 Look for Greg Halla & Miles Devine to finish first & second, followed by Haddon Twp Tim Kenna & HH Nick Gandolfo-Lucia. The remaining Dawgs should round out the top 10 which should include Pat Shea, Alex Gigliotti & John Greenberg. 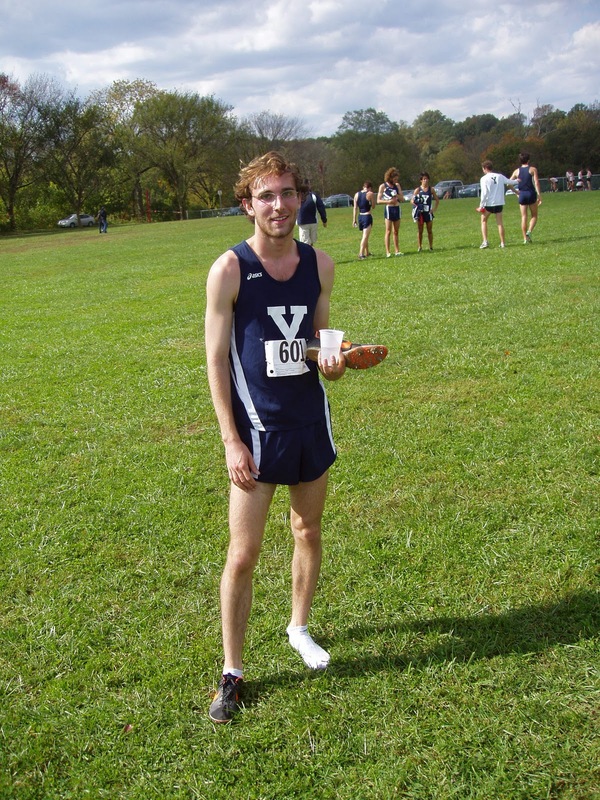 The current course record is held by HMHS standout, Boo Vitez who blistered a 14:57 in 2009. No team competition exists, however the first 10 finishers earn all conference honors. What makes tomorrow so exciting in my mind, is that the dawgs run & train on the course most Tuesday afternoons, but rarely are they allowed to race. Coach Baker & Coach Brennan typically have a plan that starts in early September and continues into October. That plan consissts of working out, doing tempo runs, & training through the conference schedule. The Dawgs usually save their racing for the Invitationals on Saturday. However, once a season at Pennypacker, the home course, during the Conference All Star meet the gloves come off, the flats come on, and the Dawgs are allowed to throw down. It is the highlight for each Dawg, prior to heading into the championship part of the season which starts the first weekend in November. The same questions get asked each year. How fast can I go? Can I make the list? 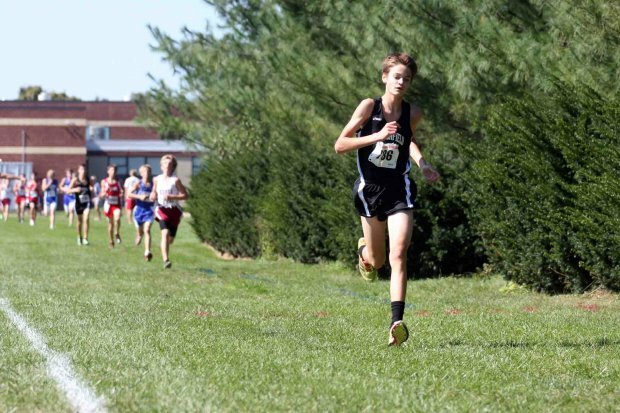 How fast did Matt Nussbaum run as a sophmore? Did Colin break 17 minutes as a freshman? All these questions and more will be answered tomorrow. This will be captain Miles Devine last time racing on the home course. Miles truly epitomizes what it takes to be a Dwag. Hard work, dedication & having the heart the size of Texas. It's his heart that has enabled Miles to make the sacrifices to stay with the program & push past the pain. Congratulations Miles! 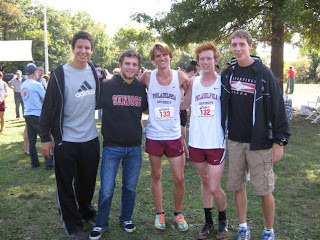 Today might have seemed like an ordinary xc meet to most, unless your connected to the HMHS boys XC team. Today a streak, that started after an early season loss in 1997, and has continued through October, 2011. I would compare the streak to the 1972 Miami Dolphins. The 1972 Dolphins are the only team to complete an entire season, including the playoffs undefeated. Every year, when an NFL team doesn't go undefeated, the '72 fish crack open champagne to celebrate. The Alumni and those associated with this years team, have reason to celebrate, albeit for a different reason. The current undefeated dual meet streak continues. That's 15 years, and 142 straight dual meet wins with out a loss and counting! Most of the team members on this current crop of young men weren't even born when the streak started. Running on the "A" course for the first time this year, the dawgs were able to beat West Deptford, Overbrook, & Lindenwald. I caught up to coach Tom Brennan and asked a couple of questions about the streak. TM: Tell me what the streak means to you, the team & the school? TB: I think what it really means is the program coming together. I was on that team that lost, and it was a battle between Haddon Twp & Haddon Heights in the early part of the streak. It all started coming together when 10 guys would go to XC camp, show up in the summer to train and be willing to do the work. Once the program got rolling it was easier to maintain. TM: Haddonfield is a relatively small school that fields a Varsity, JV & freshman Football team as well a the same for boys soccer. Is it ever a struggle to get kids out to keep a streak like this going? TB: Not since Maureen Baker put the middle school program in place. That is the number one reason we able able to get kids. Every year we get 5 or 6 kids (freshman) to buy in to our program. Also the tradition of seeing previous teams succeed at the sectional, state, & national levels help. The younger kids see the work necessary to keep the program & the streak going, and they want to get there to. They know the work that is necessary to continue being good. TM: The last couple of years you and coach Baker knew the kind of teams you had. How exciting has this year been so far, especially after the recent success at Shore coaches? TB: Coach Baker & I knew we were going to have a good one. I don't think anybody outside of our program knew we were going to be good. Coach Baker & I couldn't wait for this season. As much as we love Matt, Ben& Timmy it was time for them to move on. This year is exciting, and I don't want to seem over confident, but it's fun to worry about states & sectionals. Highland moves to Gr 2 and we have to worry about them. Last years team was MOC & Nationals-this year we have to be ready to run at sectionals & States as opposed to years past. Theses guys, (6 new Varsity runners) the first day after MOC track they started meeting. They didn't want to be the group that had the streak stopped. At first they were running and training out of fear, then they got strong and wanted to be good. Winning the conference and keeping the streak going is a direct result of the hard work they have put in to this point. TM: The streak has been going on for 15 years now. Why do you think kids have become some much better over that 15 year period? TB: This may sound a little out there, but I believe its because of the Internet. The first time I saw Dyestat was when Erin Donahue had her hands raised after winning a national title. Dyestat became huge to a sport that wasn't all that popular. 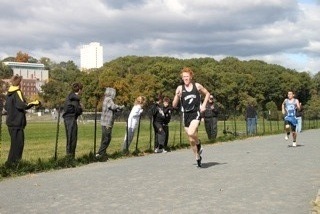 Back when I was running you got results once a month and had no idea how kids were training. There was a little paragraph about meet from each state that happened a month earlier. Today, because of the Internet you know what a kid in CA is doing in a workout an hour after he did it. The amount of information that gets shared is also a reason . I think corporate sponsor like Nike, Adidas & New Balance have created big time events and created some hype. Also, I think the kids do more work & mileage, due to the information available on the Internet. Thanks Coach Tom for the time today - Good luck as the Dawgs head into the championship part of the season. I had a chance to catch up with Connor Jacobs who was in attendence @ the Jack Sinclair Invitational on the famed Belmont XC course in Philly. 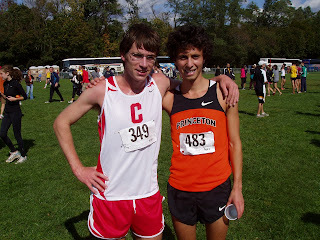 Connor who was a 4 year varisty XC member while at HMHS is currently running for the Big Red of Cornell. I also ran into Ray Schlitt who was at the SJ open in Delsea cheering on his younger sister Helene. Ray was also a 4 year varisty XC member and is currently wrestling for the Bison of Bucknell. Great to have Matt back healthy and racing again. 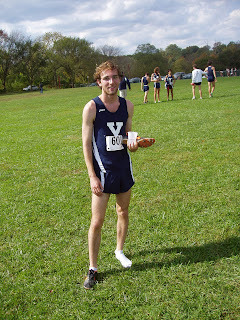 Breton currently coaches PVI boys XC team which is ranked 10th in SJ by the SJTCA. ﻿﻿ Acccording to the web site: www.dumblaws.com/ your not allowed in South Carolina to operate a dance hall, sell music equipment or do work on Sunday. Good thing we dont live in SC or we wouldnt have been able to do work at Delsea. Due to a religious holiday on Saturday the SJ open was held on Sunday. The Dawgs assembled what coach Baker calls the "little Dawgs" aka the pups. Led by Junior Robert Spaeth who finished 6th overall, the little Dawgs gained some valuable expierence on a course where future sectional championships maybe held. Danny Brennan raced to a second place finish overall while Nick Forbes 7th & James Spinelli rounded out the top 20. James Spinelli had extra motivation - his older sister Mia, who was a standout runner for the lady Dawgs in both XC & Track was in attendence. She was home from the U of Penn on fall break. It was great to see Mia and we all wish her well. Currently the Dawgs are ranked first in South Jersey by the South Jersey Coaches Association. 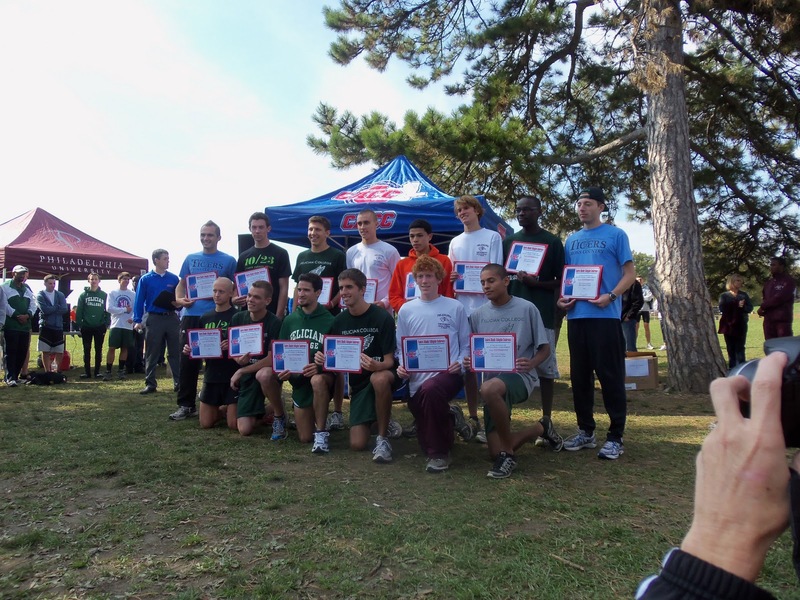 On the state level they are ranked 6th by http://www.njrunners.com/ & 6th by Jim Lambert who covers high school XC for the Star Ledger. A dual meet @ Pennypacker park on Tuesday- Hopefully we can get the "A" course back. Saturday the Dawgs travel to Van Cortland Park in the Bronx NY. 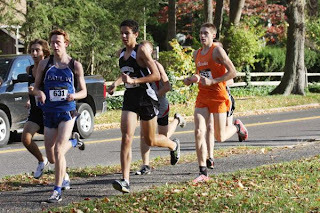 The HMHS boys XC team competed in the Shore Coaches invitational at historic Holmdel park. The boys competed in various races ranging from freshmen, JV & championship races. The beauty of Holmdel is that you can go any where in the world and talk to someone who competed at Holmdel and compare times. This year Championship race featured the No. 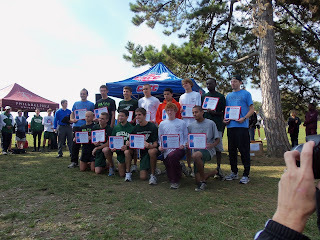 1 XC team in the nation in CBA & the No 13 in WWPS. It also had the No. 2 XC runner in the country, Edward Cheserak from St. Benedict's. So how did the Dawgs do? Very well. They finished 4th! The team stepped up in a big way. This years team ran a team avg. of 17:04. It saw 5 of the 6 dawgs set PR's. In some cases it was the first time on the course in a race. ﻿ Holmdel has a way of ripping out the souls of many of men. You can't go to the line hoping tradition will carry you to a nice time. If your not ready, this course can break you. This years Dawgs are getting ready for another late season run, and creating there own tradition. There is still a lot of work to be done , but if I had to give a mid-term grade it would have to be an "B"
Next up the for the dawgs the SJ open at the sectional course on the campus of Delsea. This years race will be run on Sunday due to a religious holiday on Saturday. ﻿ This past friday five former dawgs were in action. Boo Vitez & Colin Baker (Class of 2010).Boo, who currently competes for power house Princeton University & Colin who runs for Penn State competed at the Notre Dame Invitational in South bend, IN. Three other former Dawgs toed the line at Paul Short on the campus of Lehigh. Ben Potts who runs for the Big Red of Cornell, Tim Malloy & Eric Lacy who run for the Rams of Philadelphia University. On October 29th the Ivy league Heps will be contested on the fields of West Windsor, NJ.